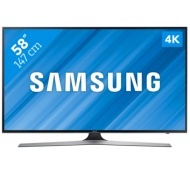 alaTest has collected and analyzed 96 reviews of Samsung UE58MU6120 Series. The average rating for this product is 4.6/5, compared to an average rating of 4.3/5 for other products in the same category for all reviews. We analyzed user and expert ratings, product age and more factors. Compared to other products in the same category the Samsung UE58MU6120 Series is awarded an overall alaScore™ of 89/100 = Very good quality. The picture quality is excellent. A massive step up from my 4 year old tv. It also has an easy to navigate menu screen. 1. Doesn't have an audio/headphone jack. 2. The stand if fixed so doesn't rotate. For the physical size of this tv it would do with this feature. 3. Only has 3 HDMI inputs. Really nice TV I found it easy to use not being very technical. Defo need a sound bar.